As I write this, GenCon 2016 is in full swing, and with it comes a whole host of new releases. The tabletop gaming hobby, and most especially boardgames, seem to rely more and more on ‘The Cult of the New’ – by that I mean that that there are more and more products hitting the shelves every week, with each one clamouring for attention from the hobby gamer – there are so many it’s difficult to keep up…I know, there was a time when I used to try! “You can only play so many games in a year” he used to say. “Buying more games simply means that you end up diluting the pool“. By diluting the pool he simply meant that you end up not playing the games that you like, as that time is taken up with new games which may not be half as good. And you know what? Much as it pains me to admit it, he’s right. Now, I am not for one minute suggesting that companies should stop producing new stuff – that simply isn’t going to happen, and producing new games and miniatures is part of the lifeblood of the hobby. Without new games being published, I would never have discovered the likes of Sword & Spear or Chain of Command. However, what I am suggesting is that we don’t spend so much time chasing after what is new that we neglect what is old. Just because a game is old, doesn’t mean it’s bad. 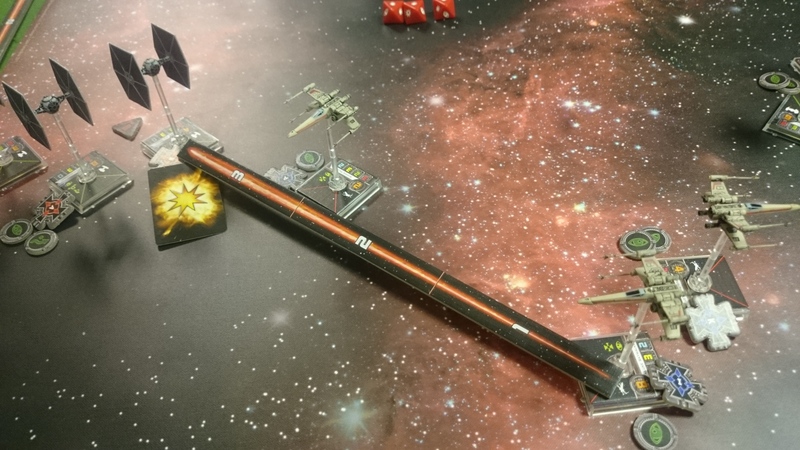 Over recent weeks I have played three games that I previously hadn’t played for three or four years – namely Saga, X-Wing Miniatures Game and Commands & Colors: Ancients. Without exception, having played them again I can confirm that they are all still great games. So why is it that I haven’t played them for so long? I think the simple answer is that I have been busy playing other games. We lead increasingly busy lives, and the vast majority of us have limited time in which to indulge in our hobbies. This may well mean that we only have the opportunity to play a game once a week, or maybe a lot less often than that. If you are only limited to 30 or 40 gaming opportunities a year, what are you going to play? For me, it was probably two or three years ago now that the penny finally dropped – I was never going to paint all the models that I owned, or play all of the miniatures or board games in my collection. Having finally come to that conclusion, the obvious question was: “what am I going to do with that information? ” I took what was probably a drastic approach, which was to identify all those games and models that I knew I was never going to use – or maybe just identify those that I couldn’t (at that time at least) bear to part with and put these to one side…the rest were sold or given away. It was actually a tremendously liberating experience, but it’s obvious that two years later I maybe wasn’t ruthless enough, as there are still models in my collection that I haven’t touched, and games that I have yet to play, or not played in a very long time. Can I bear to part with any more? Probably not at the moment, but I am content to be very careful about what I purchase from this point on. Guildball: The latest ‘newish’ game to be added to my collection. But I am going back and playing games that I fell in love with a few years ago – it’s almost like rediscovering them afresh. I only ever played a few games of X-Wing, despite collecting over 20 models for the game. Last week I played a couple of games against Josh – it was the first time he had played the game. The result? We played again today and I think we are likely to be playing this regularly for the foreseeable future. I had to remind myself of the rules of Saga in order to help Per Broden run games at the Joy of Six show. After playing a couple of games I was again reminded of just how good a game Saga is. Consequently I painted a unit of Norman Warriors that had been sat on my painting desk for three years – and my painting desk is currently covered by no less that 32 Norman cavalry, as I paint mounted warrior units for my Norman & Breton warbands. Mike Hobbs discovering Commands & Colors for the first time led me to play a game of C&C: Ancients again…and remember why it was my most played game of 2011. C&C: Napoleonics is also a great game, and yet I have hardly scratched the surface with that (I think I have only ever played 3 or 4 games, despite owning all of the expansions) – and yet I am currently looking at learning Blucher, which may scratch something of the same itch – who knows? This week we interviewed Keith Flint, author of the Honours of War rules for Severn Years War, for a forthcoming podcast As part of the discussion, we discovered that he has only ever gamed two or three periods, and has no inclination to expand this at all. As something of a wargaming magpie (slightly reformed, I might add) I still wonder how people can do that. Despite my gaming ‘cull’ I think I have miniatures and rules for at least a dozen different periods, genres or scales – and that isn’t counting boardgames! In many ways I envy people like Keith, who are happy to collect and paint one or two periods. But at the same time I recognise that I probably wouldn’t be happy to do that – I simply like too many games and periods. Maybe the only solution is to become tremendously organised and disciplined, and plan my gaming to ensure that all the games, rules and periods that I want to play are timetabled into a schedule – but to be honest that seems far too much like hard work. I suspect that I will continue on as I am currently – but don’t be surprised if, in a year of two’s time, I am commenting about the fact that I have played Sword & Spear for the first time in ages and was reminded just how good a game it is. If I do, you have my permission to comment and say “I told you so”. I’m with you Neil. After playing your cracking 15mm CoC game at OML4, I thought it looked so good in a smaller scale, that I started my purge by clearing out all my painted 28mm WW2 kit, leaving me with two painted basic British and German forces if I’m playing 28mm. I have a huge number of 20mm figures and vehicles all painted from my Rapid Fire days which are now seeing CoC service if you’ll excuse the phrase. A minor epiphany but it’s a start…. If I was starting ww2 now I’d probably go 15mm. But I’m not going there – honest! I’ve been simplifying and contracting my gaming. I’m down to late 19th Century colonials (TSATF), 15mm WW2 (CoC mostly), 15mm Sci-fi, and 28mm fantasy (Open Combat and SoBaH), and a handful of BattleTech mechs. My painting/building que is 1) historical 2) not historical 3) terrain piece, 4) Go to 1. I also don’t buy anything for a given project until I’ve painted my last item for that category. So I have some British Camel Corps to paint up and then I can get more colonials. It’s kept things in check nicely. “You can only play so many games in a year” he [Luff] used to say. “Buying more games simply means that you end up diluting the pool“.